Start your Tennis Future with a FREE introductory assessment lesson at one of our venues. * Free Intro Lesson is limited to one session per person and booking must be made before the end of this month. Limited sessions available. I really wanted to write a note to Wes and all the other wonderful coaches that my son Lachie has had over the years at Futures (I think he has been there consistently since he was 3 or 4 and he is now 13!). While he is not looking like he will play at Wimbledon, he is playing tennis for his summer sport at secondary school and has a genuine love for the game and sound skills (he was number 3 for his Year 7 team at Caulfield last year). 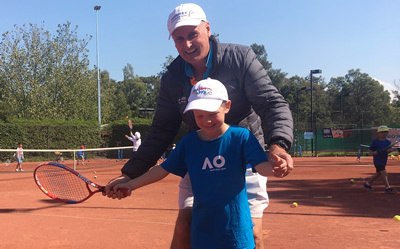 Our family of three have all been coached by Futures Tennis at East Malvern Tennis Club for over 5 years. We all love it! I take ladies classes, my husband does private lessons and my son does squads. The professionalism, dedication and coach feed back is second to none. Coaches are always enthusiastic, punctual and relate to both kids and adults alike. They are keen to help us improve our technique and strategy of the game, whether beginners like our kids or a more advanced adult like ourselves. Just wanted to thank David for being so efficient and helpful with our requests. The Holiday Clinics and Friday night comps, as you suggested, were a great way to introduce the kids to classes and competition. I now love watching the kids skip up to the club and eagerly wanting to get on the courts! They love it! Thanks Wes & team for equipping our son with a love of the game and developing a great technique that will put him in great stead throughout his life - tennis is a fabulous sport and life skill that all three of us enjoy as a family. Hi Futures Tennis, James was rapt with his new racquet from your Pro Shop and his coaching this term! We are so glad we joined. He said he wants to become a champion now - not bad for a 5 year old! Please past on our sincere thanks to Wes and his coach.